Four independent novellas by four outstanding authors, linked by theme and their shared cover art. Two centuries after the Earth fell to enigmatic alien machines known as the Visitors, humanity survives in sparse nomadic tribes. Macsen is an adventurer, undertaking hazardous quests for the captivating Hona Loy; quests that have made him a hero. Macsen never fails, but this time he crosses the path of a Jugger, one of the deadliest of all the Visitors. 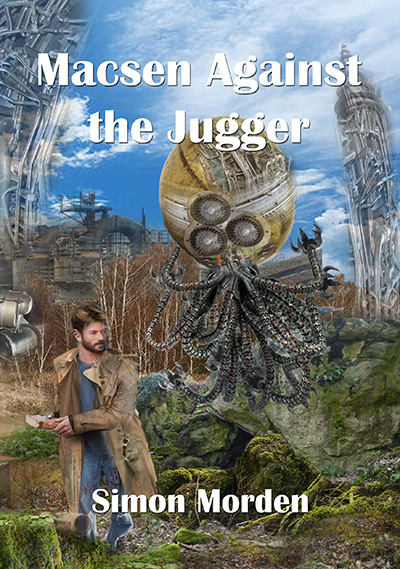 Can he find a way to defeat the alien and survive, or will it fall to his faithful companion Laylaw to return to the tribe with the tale of his noble death? Available as a signed limited edition hardback, a paperback, and an eBook. Also available as part of a very limited slipcase set featuring signed limited edition hardbacks of all four novellas in the series.